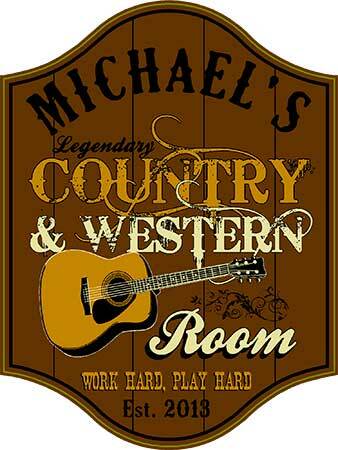 Personalized Country & Western Room Sign – With the Personalized Country & Western Room Sign you can express your passion for country music in your home or office! The handmade sign can be custom ordered to any name you wish. Created from hardwood composites this unique sign makes for great room decor in a bedroom, music room, rec room, man cave and more! Comes with pre-drilled holes for easy mounting. Limit 15 characters in personalization. Made in USA. Interior use only. Size 12″ x 16″ x .5″. *Please note: Personalized items are non-returnable. *Please put the name to be personalized in the “blank box” when checking out.